Is every grieving the death of a loved one different? Or are we different each time a loss visits us? When my brothers, Jim and Dan, died 4 years ago, I felt like part of my heart had been ripped out. The grief I experienced recently when my father died was felt mostly in my gut, as though I had been punched in the stomach and left with a sick sinking hole. Several of my siblings expressed at the funeral that they felt like they had a stomach flu. Some of my recent symptoms of grief feel familiar, but some are different. With both, I felt identity confusion. After losing Jim and Dan, I wondered why I lived in Virginia, when they were buried in the Massachusetts town we all grew up in, in the very cemetery we played in as kids. I mourned the loss of my childhood as much as I missed my brothers. The identity crisis I'm experiencing with the loss of my dad is less about where I live and more about who I am. Who am I without a father? Who is my mother without my father? Who am I to my mother now? Can I let go of the burden my dad carried that all his kids shared the weight of, the burden of seeing the Holocaust first hand, WWII combat trauma, and his battle with alcoholism? There is a sense of calmness (or is it numbness) along with my sadness that I wasn’t able to feel when Jim and Dan died. Is it because my dad lived for 81 years and had been drifting away from us before the accident that led to his death? Since the deaths of his sons, and especially during this last year, he sometimes seemed to be going through the motions of life more than living them. “He did everything he wanted to,” my mother recently said to me on the phone. The loss of a parent can shake our sense of security, identity, and foundation. But unlike losing a sibling, child, spouse, or a parent prematurely; losing an older parent is something we’re conditioned to expect. We know life ends, just as we know the day will end when the sun goes down. As hard as losing a parent is, we don’t have to feel alone in it. It’s something we all have in common or will someday. I’ve only begun to absorb the impact of not having my dad in this world, but I’m grateful that I feel more in control of my grief this time around. At least today, I do. 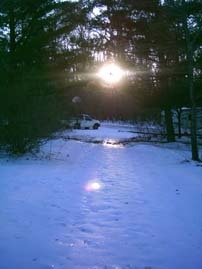 Photo: Icy path to the driveway illuminated by the setting sun. I'm facing the loss of my father, as well. He's the glue that holds my scattered family together. Having never lost anyone that close to me, I don't feel like I have the tools for the time when he will yield to the cancer that cannot be cured. It's scary, and I can only imagine what you have dealt with, losing so many people close to you in such a short period of time. In the meantime, I am going to do my best to celebrate my Dad's life while he's still alive to do so. Your pic nicely illustrates your post. I begin "The Jim and Dan Stories" with a quote from Wendell Berry from one of my all time favorite books "Jayber Crow," "One by one we lose our loved ones, our friends, our powers of work and pleasure, our landmarks, the days of our allotted time. One by one, the way we lose them, they return to us treasured up in our hearts. Grief affirms them. Preserves them. Sets the cost." I love Wendell Berry's writing, and I think Jayber Crow is a character from the same town as Nathan Coulter. That photograph is just beautiful Colleen...truly stunning! And by the way, all the Cats at Shambala are adoptable...in fact some have mutiple adoptive parents....so I'm pretty sure Patrick is adoptable. Maybe losing your dad has been easier to deal with because you have learned how to make peace a little with death through your brothers? I love the pic! I have always liked the sunset more than the sunrise pictures. I actually had one of your brother Jim's sunset pictures hanging in my room at my parents house! I totally forgot about that picture! It was a beach scene. Beautiful oranges and reds. Yes Tammy, there is something bittersweet about the sunset that I love, and I find the glowing light at dusk to be magical, almost supernatural. I was talking to Joe about this subject and he said something similiar to you...that I probably have learned some skills to deal with grief after going through Jim and Dan's death. I agreed. But I also have learned how to just not think about it (after 4 years) because it doesn't change anything (on one level). The trick is to not avoid feeling the process of grief that helps you move on, but to try not to be obsessive about it and to give it some balance in your life. I'm not sure you always have the choice. But ultimately, I do think Jim and Dan's deaths prepared me somewhat. Colleen, I lost my mom before my dad. It hit me hard, but she had been ill for a while and I did expect her to go anytime. My dad died 10 years later. After he died, I felt like an "orphan" and felt bereft at having no one left who was older than I (no siblings either). About 2 weeks later, I heard from my birth mother for the first time. Oddly enough, I STILL felt like an orphan, and still do to this day - even though bio mom is still around. My dad changed after mom died - for the better. She had been such a strong person that he seldom spoke or gave an opinion while she was alive. Boy did that change! He started talking and he rarely stopped for the next 10 years! I learned things about him I had never known, and grew to love him even more. Perhaps you will have that with your mom now. I am not prepared and I am having a hard day of it. I miss my family!!! If the young tree did not have to stand against the strong winds, how could it grow into a mighty oak? Your grief is not less with the loss of your father, it may likely be deeper than with the loss of your brothers. You, however, have changed because of your brothers deaths, you are stronger. Your mother sounds like an exceptional woman, strong and loving. You are blessed with such a family. This too gives you much strength. I believe each grief is different and the same. The pain may be similar but the life experiences differ. This is not an easy road you are walking. I am glad today is a little better for you. Yes, I do believe that grief takes many shapes and forms, and is different each time and with each individual. After my mom died, I attended a "grief support" group that was being offered in our town. Grief is much like journaling. There is no set sets to how one grieves. Everyone will do it differently. With me, it was a combination of what you experienced. I felt like someone had socked me in the stomach, but my heart physically hurt as well, I often coudln't catch my breath it hurt so much. I spent alot of time in the shower, crying. I had lots of anger. Even at her, for leaving me, for doing this to me. But. Life goes on. As I touched on in my entry, I had to assume responsiblity for my aunt. We buried mom on Wednesday. Friday, I get a call from the hospital. My aunt had used her "life line" button and they coudln't get her to respond when they called back. So the roller coaster ride with her began. My ex-husbands sister died a couple days before Christmas. My boys (ages 27 & 28) wanted to attend the funeral and see their dad. They wanted me to go with them (we live in Kansas, he lived in Michigan). I'm sure most people wouldn't agree -- but I'm glad I went -- even though I spent Christmas day in a motel room, by myself. I was able to grieve and not have to put on a "happy face" at family functions at home. No one questioned my tears when I attended her funeral. My ex-husband never shed a tear. But. Thats just the way he is. One of the reasons we got divorced. He is/was so emotional-less. Thank you for sharing. As you said, we can relate. Hey lady. That ice there had our phone out almost all day yesterday. Scary when you're home with an asthmatic child & your car IS NOT going out in the ice....anyway, I truly hope things start getting easier for you. Both of my parents are still alive so I can't imagine what it's like, but you have my sympathy & my prayers. (Initially tried to post on 12/16) Each death of a loved one that I've experienced has been different. There are certain levels at which one prepared me for the next, but others in which it did not. What my father's death signified was that in my immediate family, I am the only survivor. Hi colleen I hope you remember me from the Hull reunion in May of 2005. I was the one who saved the letters from Sherry. I occasionally read you current letters and It just came to my attention that your dad past away. I am so sorry and was not aware of his death and very sorry I did not attend the wake. I got a chance to meet your dad at the reunion so I am happy for that. Please send my sympathy on your dads loss to sherry. Hope all is well with you and the Redman clan ad I will continue to follow your website. Thank you, David. I surely do remember you and will pass on your condolences.